Welcome one and all to the inaugural post of Hyrule.net's chapter of "The Merry Marvel Marching Society". This thread is your one stop shop to discuss every one of Marvel's vast and varied Universes. From the original (616), to Ultimate (1610) and even the recent Cinematic Universe (19999). No topic is off limits except for *shudder* DC comics. Take that crap somewhere else. To celebrate the 50th Anniversary of Spider-Man the Mighty Minds over at Marvel are finally crossing over the two main Universes. 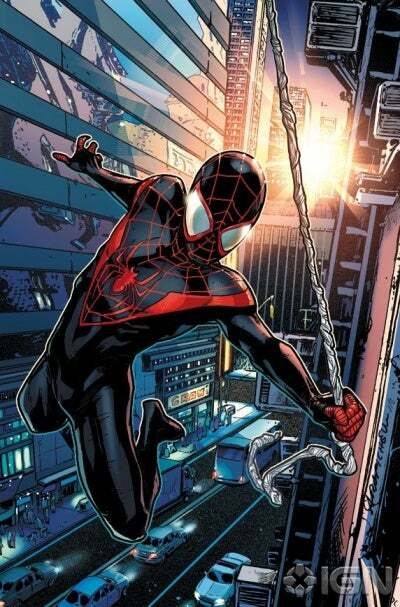 This June Peter Parker aka Spider-Man (616) will cross the dimensional divide and meet Miles Morales the new Ultimate Spider-Man (1610). How will Miles handle comic face to masked face with an adult version of his namesake. How will Peter Parker handle being in a world where he no longer lives. Will Aunt May and Mary Jane Watson get closure in seeing that Peter Parker (in at least some form) has grown up into a capable and heroic adult? What are your thoughts on this Spidey story? As well as the Death of Ultimate Peter Parker and the new half black half hispanic Spidey? Sort of yes. After the (presumed) death of Johnny Storm, Spider-Man joins Reed, Sue and Ben as a new team called The Future Foundation. The X-Men, Spider-Man, Avengers, Fantastic Four and many others are all part of the same Marvel Universe, known in the Comic Community as Earth 616. So how bout that Batman, eh? Something crossed my mind just now. Does Cyclops sleep with his visor on? I can't imagine that it would be comfortable. I mean, think about it. Alarm clock goes off, wake up and BAM! Bedroom has a skylight now. I'm not an avid reader of X-Men but I suspect that he wears Ruby tinted glasses when he sleeps. Or he instinctively knows not to open his eyes until he puts them on in the Morning. Who did you side with on Civil War? I sided with Captain America. Didn't like how Iron-Man's side was detaining super heroes for being, you know, super heroes!! Although, I still donno who to side with in Avengers VS X-Men. I think both sides are being childish, though I suppose X-Men are being more dickish. Wolverine, man he's probably right (he's like the 3rd party it seems) but I just don't like what he wants to do. Also, super disappointed in the AvX art. Not as bad as House of M event but... gosh. Fear Itself and Secret Invasion had the best art in my opinion. In the 90's a deranged scientist named Miles Warren created a clone of Peter Parker. Ben Reilly became The Scarlet Spider and later took over as Spider-Man until he was killed. But at the same time there was another clone, a imperfect clone who went by Kaine. In time Kaine too died only to be reanimated by Warren during the "Spider Island" limited series in which Warren gave all New York citizens Spider-Man like powers. They used a cure made from the curative powers of the Anti-Venom which also cured Kaine of his further Genetic tampering, his madness and his physical wounds. He emerged a full physical clone of Peter Parker. The two went on to defeat Warren and the Spider Queen. Alive and Free the new Kaine Parker left New York taking with him a suit Peter Parker made during the "Brand New Day" arc. He now fights evil in Houston in the pages of Scarlet Spider. All of the powers, none of the responsibility. Yeah, Spider-Island was great. Surprisingly great! Too bad it was over shadowed by Fear Itself. But lets get back to Ammonsa's question, as I think it was a good one. Who did you side with in Civil War? And to add to that, who are you siding with in Avengers vs X-Men? I was always against Super Hero registration, even back when they wanted Mutants to do it. As for AvX, I really haven't decided yet. But I'm leaning towards The Avengers. I'm currently focusing all my comic time on Spider-Man Ends of the Earth. What do you think of Flash Thompson as Agent Venom? I only read about Venom in Spider Island, but I though he was pretty darn badass. He has his own series where he joins the Secret Avengers post Spider Island. What do you think Marvel has in store for the Webslinger for his 50th Anniversary? Besides the cross over? I dunno. I think the movie looks promising. When I saw the first trailer it looked like he was going to be mopey as squid Peter again but then the recent trailer allayed my fears a little, he was FUNNY.